Rural America is mad. We’re hearing from people in places like West Virginia, Ohio, and Pennsylvania who are fed up with the government, the economy, the “establishment,” and taking out their anger at Trump rallies. While the coverage is new, the anger is not. Donald Trump is today’s release valve, the latest in a line that has included the anti-government and militia movements, drug epidemics, and the Tea Party. This year’s support for Trump, of course, goes far beyond rural voters. A recent New York Times analysis finds support for Trump is strongest in places where “white identity mixes with long-simmering economic dysfunctions,” cutting across other traditional political lines. But what has too long been overlooked is how much of that economic dysfunction—and the anger it has caused—goes back to the dissolution of the family farm. Published by Edible Brooklyn, Issue 44, Summer 2016. Take the 3 train to the penultimate stop on a summer Saturday. The barren roofscapes you see from the elevated track don’t hint that you’re entering the neighborhood with the most community gardens in the city. But walk down Livonia Avenue under the tracks, and the scene changes: there are gardens on every block, some threatening to spill through their fences, others tamed into neat raised beds. Follow signs for the farmers market—the hand-painted signage on the fence, the tempting smells and the reggae/R&B/salsa mix. Round the corner onto Schenck and you’ve found the heart-beat of this community, in the midst of the impromptu dance party, the Caribbean breakfast specialties, the hot peppers ranging across the rainbow (and Scoville scale), and the young people proudly hawking their greens and bitter melon. The market is run by East New York Farms!, a partnership between United Community Centers (UCC) and neighborhood residents to address food justice by promoting local sustainable agriculture and community-led economic development. Founded in 1998, almost a decade before The Omnivore’s Dilemma helped to popularize sustainable food nationally and, well before Brooklyn became synonymous with artisanal pickles, East New York Farms! was far ahead of the local food trend—because growing food together turned out to be an excellent way to organize the community. Just before this past Earth Day, dozens of volunteers worked with longtime members of the Hattie Carthan Community Garden in central Brooklyn to clean beds, spread mulch, and pour concrete. The garden has been a fixture in the area for decades, but just six years ago, the abandoned half-acre lot next to it was overgrown with trees and filled with trash. Today that lot is home to a children’s garden, two chicken coops, and the Hattie Carthan Community Market in the summer. There’s also educational programming for all ages and the Hattie Carthan Urban Agriculture Corps, a paid summer apprentice program for local teenagers. The volunteers came together that day at the request of urban farmer and social justice advocate Yonnette Fleming, the force behind the transformation of the once vacant lot. Originally from Guyana, Fleming has worked since 2003 to address food insecurity in Brooklyn’s Bedford-Stuyvesant (or “Bed-Stuy”) neighborhood. While working on Wall Street years ago, she joined the community garden. As she became more deeply connected to the earth, she found it harder to juggle the two worlds. In 2008, she left her job to invest herself fully in the community. A short series written for WhyHunger about activist Midwestern farmers. The research for this material was funded by the generous donors to the Real Milk Stories Indiegogo campaign. Denise O’Brien of Rolling Acres Farm, Atlantic, Iowa. Farmers are “in” right now. With today’s trend towards local food and sustainable agriculture, farmers are making the news, appearing on lists of most influential people and changemakers. The farmers we hear most about seem to be in or near cities, often new to the field, raising vegetables, selling at farmers markets. We’ve read the articles about rooftop farmers in Brooklyn and vegetable farmers growing heirloom varieties for Berkeley restaurants. They all deserve the recognition; because farming is hard work any way you do it. But there are a lot of farmers we do not often hear about. Most farmers are not growing vegetables for direct markets, and most of the food Americans eat doesn’t come from farmers markets. Corn and soybean acreage is 36 times that of vegetables, while the value of the top five commodities (corn, soybeans, animal products) is 200 times that of direct sale items. Most farmers, therefore, live far from cities, raise corn and soybeans and livestock, and sell into commodity markets, not farmers markets. And (surprise!) many of them are trying to change the system they’re in—by using fewer chemicals, or planting cover crops, or making the three-year transition to growing organically or looking for a local market for their product. Even bigger surprise: some of these rural commodity farmers are outspoken activists, organizing against policies and practices that hurt the land and their communities. It’s one thing to advocate for a sustainable food system from Brooklyn or Berkeley, but quite another in a place where your neighbors may think you’re crazy for not using genetically modified seed or for restoring a few acres of native prairie; where any change you make could cost your livelihood or your relationships; where the herbicide salesman is your nephew and everywhere you turn you are reminded that you are “feeding the world.” But organizing and changemaking are also more urgent in the heartland, when the farms being sold off belonged to your friends, or you have to drive another hour for groceries because all the stores downtown closed, or your kids are getting sick from pesticide drift. To make change in the belly of the beast—in the places most of our food comes from and where agribusiness has a strong hold—takes conviction, hope and a willingness to risk being an outsider. The US has a strong history of agrarian-led advocacy. There have been movements for what we now call sustainable agriculture for centuries; most led not by people in urban centers, but by rural farmers. In the 1890s, farmers across the country realized that the struggles they faced were more a result of economic and social policies than personal failings, and built a broad coalition and a strong movement, Populism and the People’s Party, to change the system. Nearly a century later, skyrocketing debt payments and a drop in exports led to the 1980s farm crisis. Hundreds of thousands of farms went into foreclosure; with fewer farmers, rural businesses failed, downtowns vacated and rural communities withered. Throughout the crisis, farmers fought back, protesting at state houses and in Washington, fighting through the courts and in the court of popular opinion, using tractorcades and white crosses marking the loss of farms to call the nation’s attention to the countryside. A Supreme Court decision eventually stopped the foreclosures, but the crisis in farm country did not end, it changed to a slow burn. In the last thirty years, farms have gotten increasingly larger, equipment and inputs more expensive, and dramatic consolidation has shrunk farmers’ market options. The prices farmers receive for their goods dropped precipitously following the removal of all price stabilizations in the 1996 farm bill, and a patchwork of subsidies and insurance has not made up the difference. Throughout the 1990s, the fight became about confined animal operations, or factory farms. Citizen action in states like Minnesota and Missouri kept these states from being completely overrun by factory farms then and continues to be critical in demanding state enforcement of factory farm rules. Grassroots organizations such as Iowa Citizens for Community Improvement, Missouri Rural Crisis Center, (Minnesota) Land Stewardship Project, and the Western Organization of Resource Councils have rallied their farmer and rural members (along with urbanites) for decades on these and other fights, and continue to do so today. Through it all, there have also been the quiet farmers—those who may not have actively protested, but instead resisted by changing their own farming or land stewardship practices and influencing their neighbors to do the same. The profiles in this series tell the stories of how three modern rural Midwestern farmers have carried on this legacy and are working to make change in their communities. Denise O’Brien became an organic farmer in Iowa on her husband’s fourth generation family farm, and was soon a leader in the fight against the foreclosures of the farm crisis, focusing especially on the struggles of rural women. She has worked at many levels—grassroots advocacy, non-profits, national, international, in the soil—with common threads of feminism and caring for the land and her community running throughout. 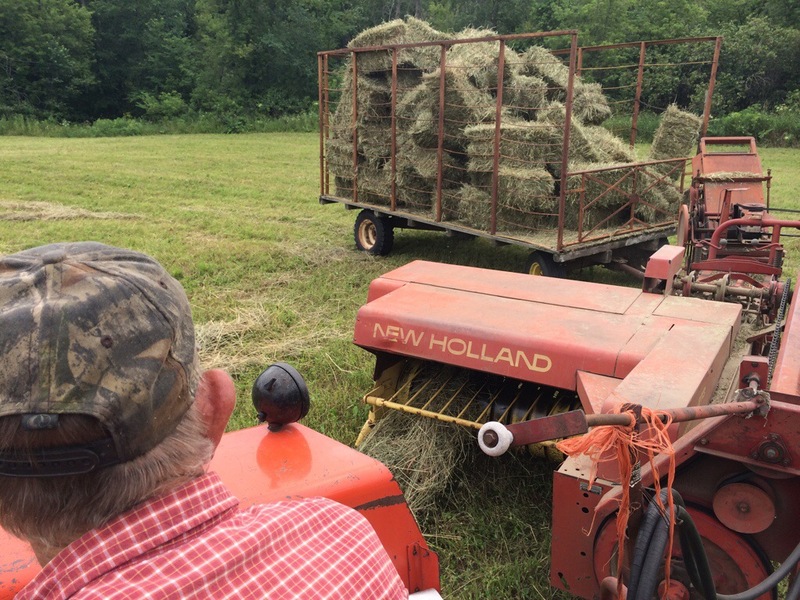 Roger Allison raises livestock on a traditional small family farm in Missouri, and has been in the trenches fighting for small farmers for forty years. The organization he founded, Missouri Rural Crisis Center, continues to be one of the strongest grassroots voices in rural America. 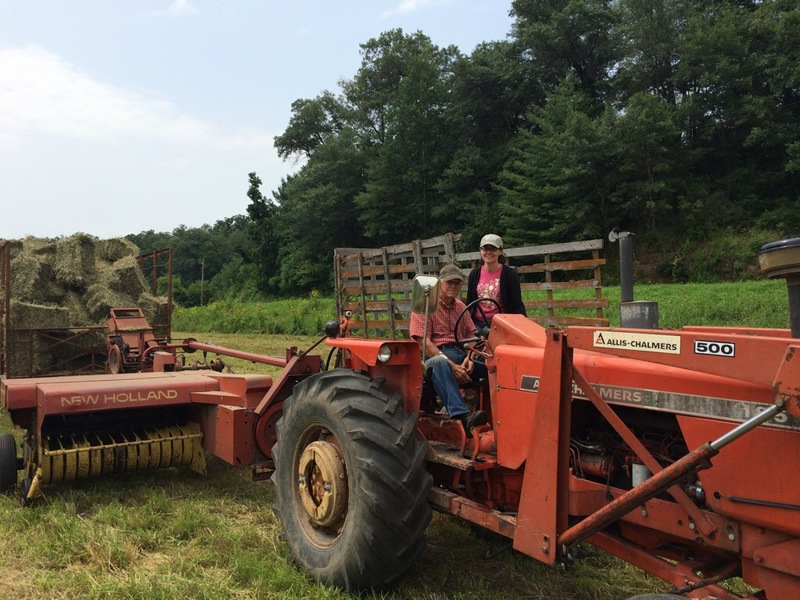 Molly Breslin and her father John have been less active politically, but have created a cultural shift in their Illinois farming community as they have transitioned their family land from conventional corn and soybeans to organic heirloom grains and beans. Leaders like these are working rural land and speaking out in small towns all across the country. Their stories have much to teach all of us working for a healthier and more just food system, whether we live in a city, in the country or somewhere in between. To learn where we have been, we must reconnect with the radical elements of this nation’s agricultural history; in shaping the future, we must listen to those carrying on that legacy. 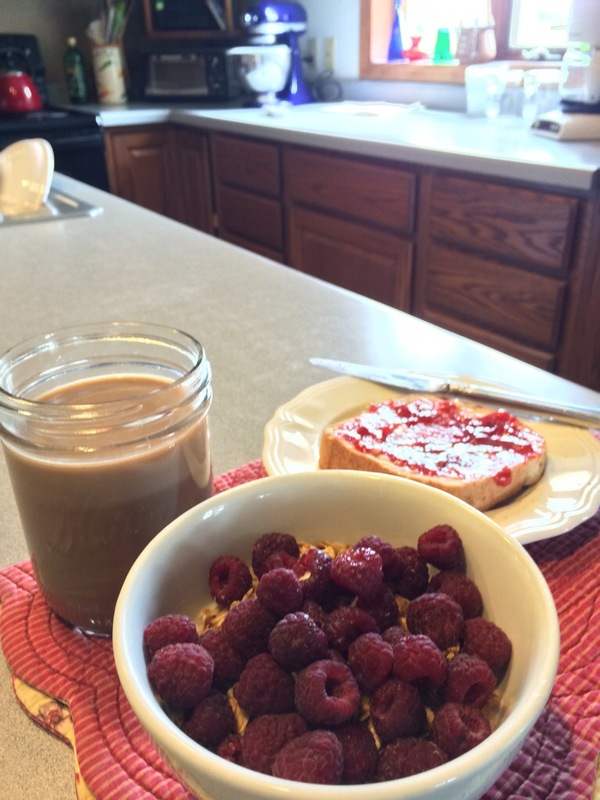 Breakfast: granola with Iowa raspberries (remains of my Iowa City – Madison provisions), homemade bread and strawberry jam, coffee. All milk from the cows down the road. 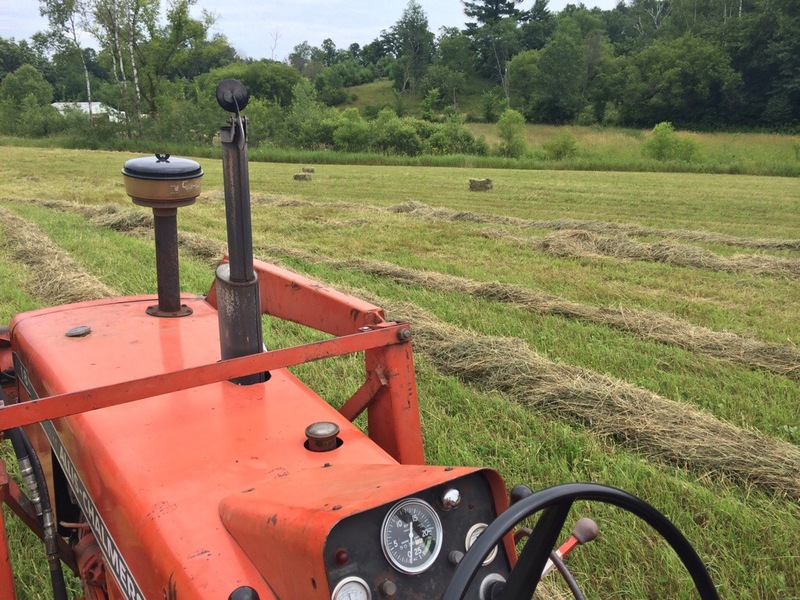 At Joel’s suggestion, his dad let me ride along while he square-baled the cut hay in Joel’s sister’s field. Another thing I’m not sure why I’ve never done, given the extensive haying around my childhood home. I was just along for the ride and didn’t do a damn thing (and my shirt definitely doesn’t match Allis Chalmers orange), but this makes it look like maybe I contributed in some way to the operation. 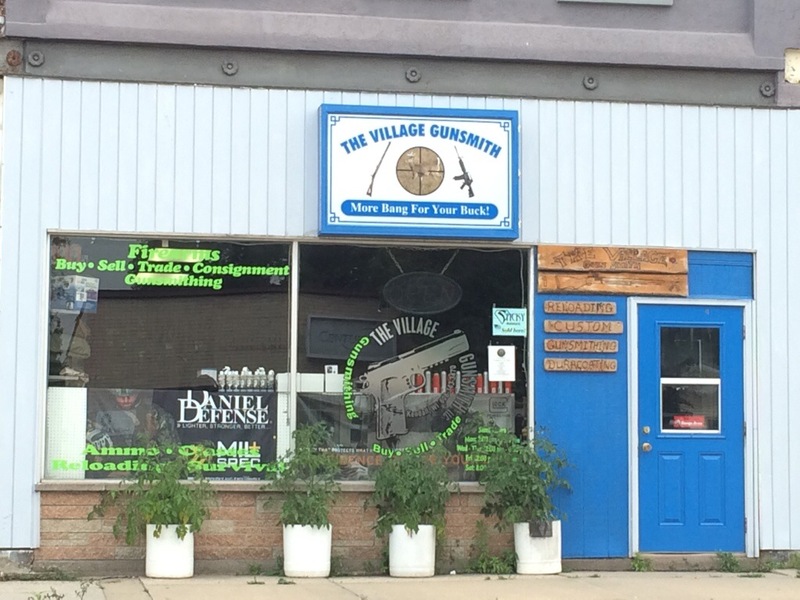 According to Joel’s dad, downtown Kendall, WI, used to have two car dealerships, five gas stations, two grocery stories, restaurants, five taverns, a drug store, a meat processor, a lumber yard… Now there’s not much more than a smoke shop, a gun shop, and a couple of bars. 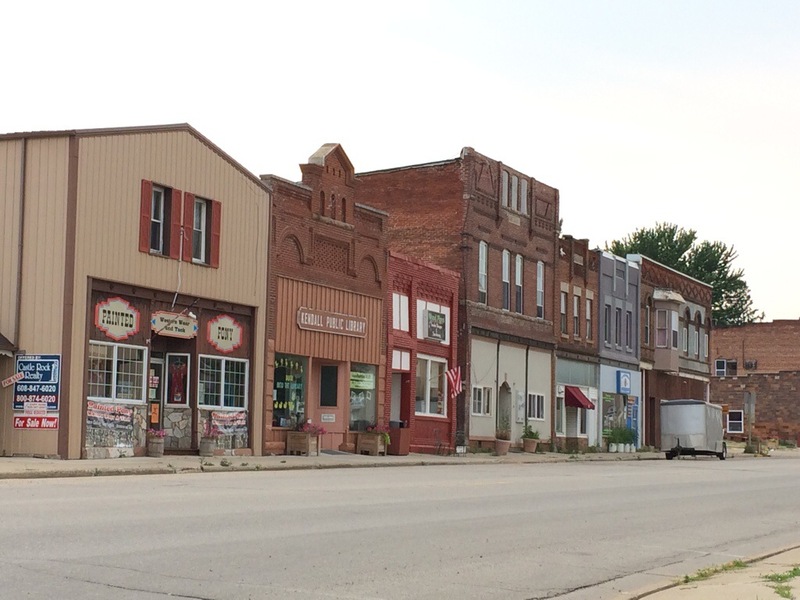 As farms consolidate, rural towns die out. 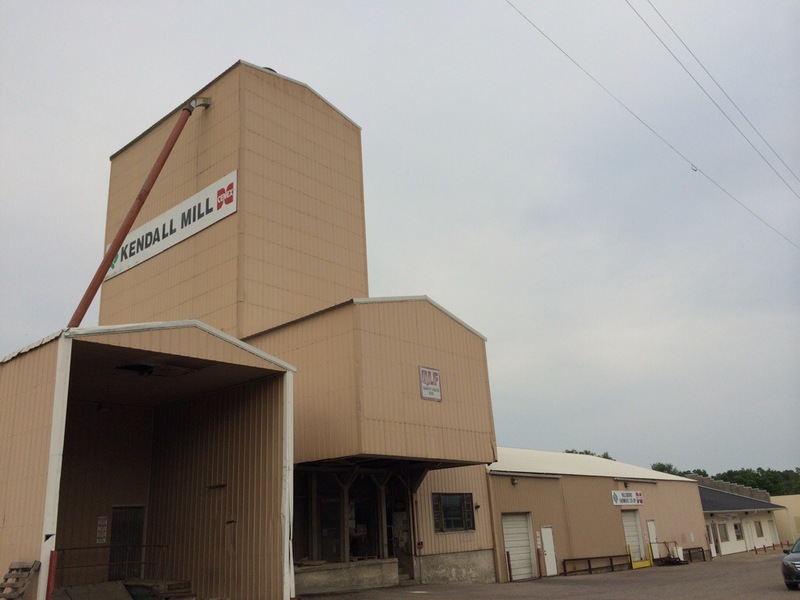 The feed mill still runs, but not like it used to. 50 years ago, it ran 7am – 6pm six days a week. I’m not sure I’ve seen it running any of the times I’ve driven by. But at least they’ve got all their important bases covered. 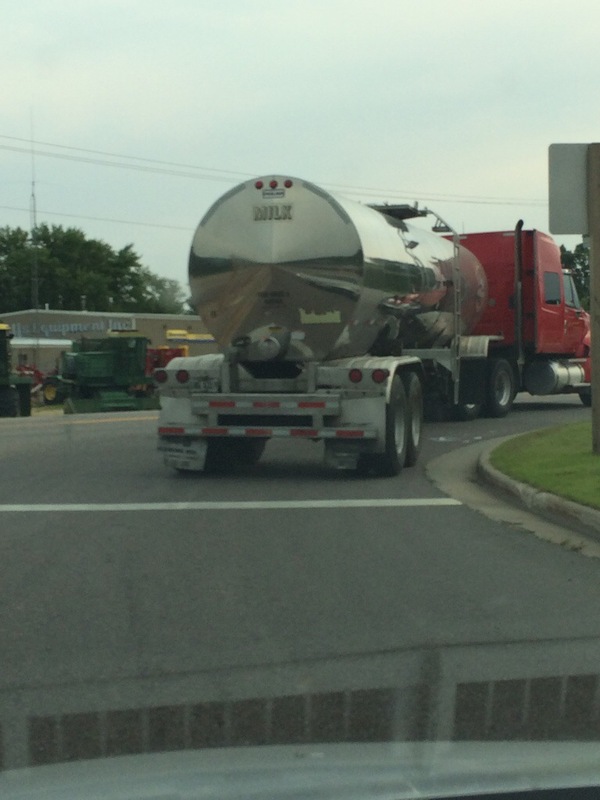 The milk truck I followed most of the way home. Not photographed: A long talk with Joel’s sister and a 4-wheeler tour of her hillside beginning farm with four kids in a wagon in back; pie and rhubarb crumble from Joel’s sister and mom; a great interview with Joel’s dad about how farming has changed; and dinner back at Jim and Rebecca’s including two varieties of cheese curds, burgers, Madison farmers’ market vegetables of many kinds, and cherry pie. Hanging with Missouri beef calves at dinnertime. The right answer, obviously, is “No, show me!” And so I’ve milked cows, sat up in a combine (it was parked, but still impressive), finally understood how a silage feeder works, checked out inside grain bins, stood in the middle of beef calves coming in to feed… (And had more bad drinks than I care to admit at the Golden Ox bar at the former Kansas City Livestock Exchange, but I suppose that’s another story…) Most of the most memorable and educational experiences of this great journey have been because my host is showing off a little. I love it. Today I got back to Jim and Rebecca’s magical farm (not its real name) just before chores. I’ve stayed here twice in the last month, and have been so looking forward to coming back at the end of my trip. Jim’s original email inviting me to stay enticed me with: “We have … plenty of quiet places, nice cows, good food and a patio behind the house that is a great place for an evening gin & tonic or a beer,” and it’s been just like that and more. I drove past the barn while they were moving the cows in for milking; I parked at the house and walked back down the road, where Jim and Rebecca were loading their two freezers in the van for the Madison farmers’ market tomorrow. When they were done, I went with Rebecca to move the pasture fence, as I did two weeks ago. “You ever driven an ATV?” she asked, as we walked towards the barn. Somehow I hadn’t, despite growing up in a farming community. Always too timid as a kid, maybe; not like my adventurous reporter self these days… She showed me how to turn it on and back it out of the barn, and said I was a natural as we drove through the pasture to the fence. Even after putting nearly 3,000 miles on my rented Corolla this month, bumping over clover, burdock, and cow pies at 15mph in the open air was exhilarating. Almost-ripe oat field, adjacent to pasture. We moved the fence — if I were a cow, I’d be pretty excited about the new patch of pasture we opened up, full of flowers and tall grasses — and I drove us back to the barn. Where Jim’s regular milking help was away, and so he seemed glad to have me help prep cows for milking: dip the teats in iodine solution, milk each a few times into a discard cup, clean and dry them off for attaching the milker. The milking equipment in his barn is a little too big for me, so the prep work is easier. Skeptical Willie. They’re fine with their back end being handled, but get a little skittish about people by their heads. Several farmers I’ve spoken with have talked about how much they love milking. They talk about it as meditative, as a time to reflect on the day and think about what needs to be done tomorrow. I don’t want to be a dairy farmer, but I’ve been lucky enough to glimpse the peace of milking time. Tonight, the milk lines clicked, the cows rustled in their stanchions, and the fan at the open end of the barn hummed, as the cats milled around in the early evening beam of angled sunlight. The barn is clean and smells of milk, grain, hay, cows, manure, and pasture. Dairy farming is hard work, but if you can figure out how to do it right (and I’ll be writing more about how much harder it’s getting…), it looks to be a pretty exceptional life. I’m grateful to have been shown just a little taste. 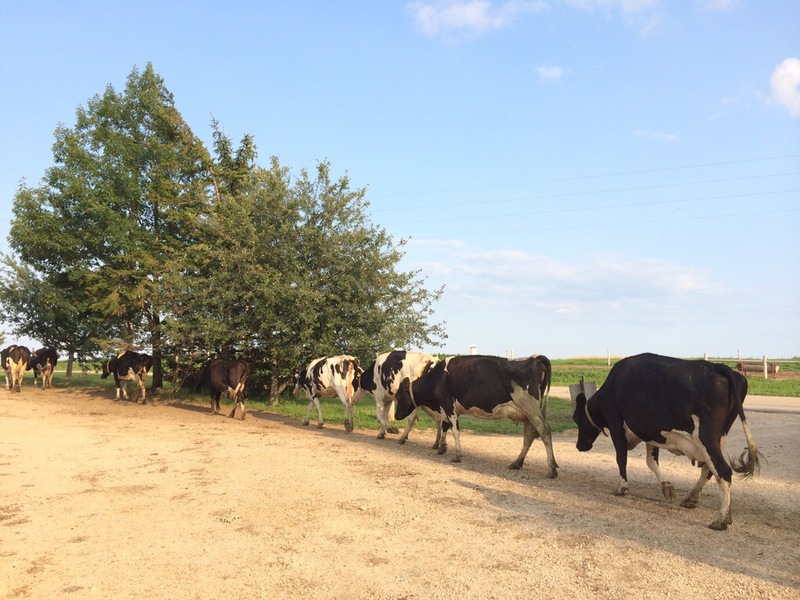 Cows meandering back to pasture after milking.